Over the last four years we have saved thousands of euros, on wear and tear, staffing levels, and diesel. I have recommended similar systems to friends who run small businesses. There is also a security factor which is a hidden benefit. Also if drivers are lost, we can direct them where to go from the office, which is handy. An efficient, professional team who deliver extremely reliable, easily accessible and flexible GPS fleet management solutions. We find the service provided extremely professional and would highly recommened it to our clients for fleet tracking. This product is backed up with a high quality service and a good support team. Your product works, well done lads. I estimate that on the first day of having Transpoco GPS tracking that it will save me about £7500 per annum by improving the way we do things, not just in better routes but in doing things in a better way commercially. That saving for a small business is a huge amount. We have been delighted with Transpoco... I couldn't imagine managing our fleet without it. Transpoco is an innovative company providing managers with valuable real-time information in a truly user-friendly interface. I have no hesitation in recommending Transpoco to any potential customer, the team, the product and the attention to detail is outstanding. From the initial enquiry to the day of the tracker installations the process was quick and easy. Thanks to you and your team. SynX is an invaluable tool to help manage the diverse fleet and operational needs across our various airport operations. The ease of use and robust reporting has allowed us to gain greater insight and target improvements. I’ve been using SynX by Transpoco for the last 4 years: Transpoco provides a good professional and reliable service, very easy to use, to track my vans. Excellent communication and back-up. The ability to generate reports and monitor vehicle usage is excellent. Guaranteed to reduce the day-to-day cost of your fleet. Good product, does everything reliably, excellent back up service, good value. Discover companies like yours who have found success with SynX by Transpoco! 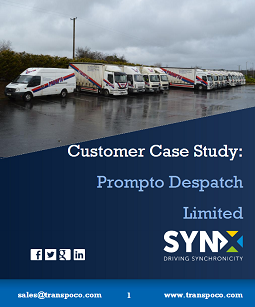 Prompto Despatch Ltd, a transport company based in Cork, was looking for a technological solution in order to improve the performance of the fleet. Their aim was to offer a better service to their customers in terms of delivery times, while at the same time being aware if vehicles were mistreated or generated excessive costs. Since getting SynX, they have improved their global operations, got back the control of their delivery performance and found ways to cut on their fleet costs, especially fuel and maintenance. Want to find out more on how Prompto could improve their delivery performance and save money with SynX? Get the complete Case Study in PDF format or read about Prompto in our blog. Radio Kerry is a local radio station broadcasting on five frequencies throughout the County of Kerry. Though it might seem unusual for a radio station to utilise a fleet management system, Radio Kerry actually had specific requirements for their fleet of 3 vehicles, used by the sales team. Being a small team, the need for managing time and resources wisely is paramount - and here is how SynX helped, in better time and team management, in streamlining sales activity and automating logbooks - helping to keep track of taxable miles. As a media company focusing on the work of their sales team, Radio Kerry has enjoyed great benefits since the implementation of SynX. 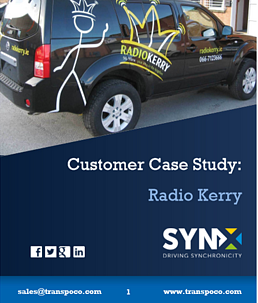 Want to find out more on how Radio Kerry could improve their delivery performance and save money with SynX? Get the complete Case Study in PDF format.